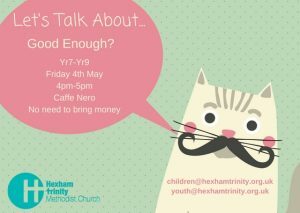 The ‘Let’s Talk About’ group meet at Cafe Nero on Fore Street in Hexham to talk about topical issues facing young people. The sessions are led by Trinity’s Children and Youth Workers and for young people who are in Year 7 – Year 9. The dates are casual, so please call 01434 601055 to find out more about the next after school session. © 2019 Hexham Trinity Methodist Church.